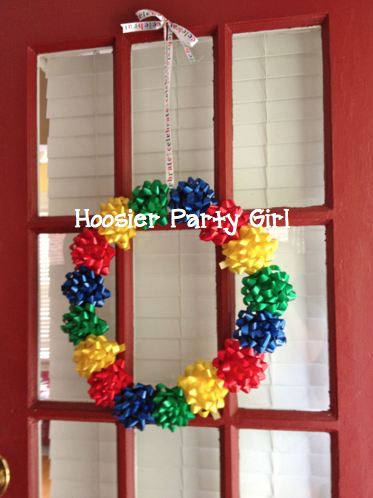 Olympic Wreath – Go Team Craft Bloggers! 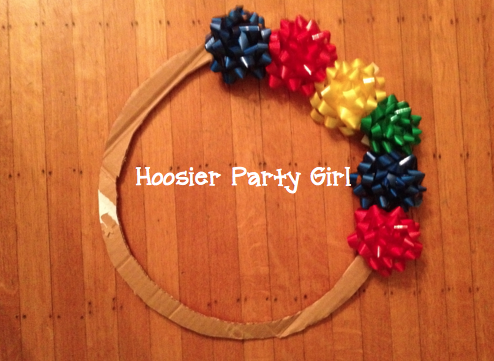 I firmly believe crafting should be a team sport, so I’m going to ask y’all to assist with my Olympic wreath. I know I am several days late, but I was out of town being professional for the opening ceremonies. So instead of the planned opening ceremonies party, my friends are having a closing ceremonies party next week. I am in charge of the wreath. 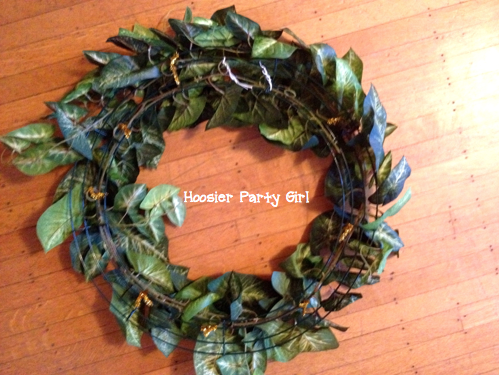 I had such grand “creative” visions of a 3/4 laurel wreath ala this headpiece from Preschool Crafts For Kids (preferably with more realism) with the Olympic rings filling in the gap. 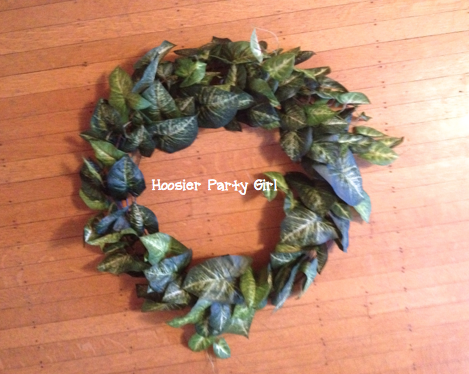 The chain of greenery seemed to be the best thing that I could find (maybe I should have gone with construction paper! 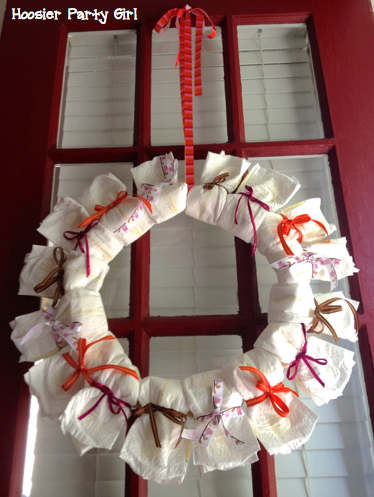 ), but it was so long it wrapped around the wreath form and kept going. I secured the chain of greenery to the wreath form with a combination of twist ties and pipe cleaners (notice I chose GOLD pipe cleaners). 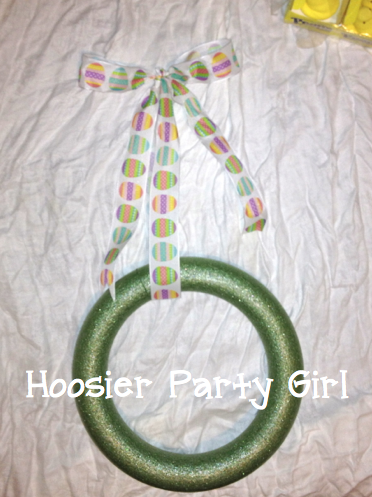 First I made a paper ring chain in the Olympic colors, but the wreath was too heavy and misshaped the rings. 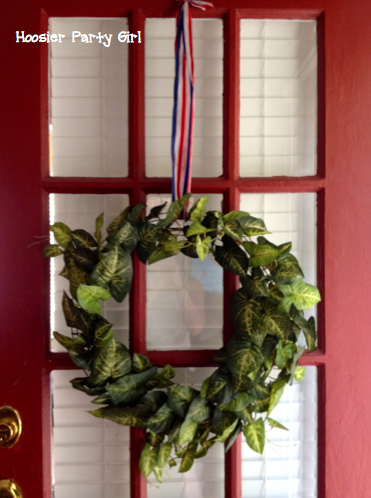 So I hung the wreath with a red, white, and blue striped ribbon from the Fourth of July. I played around with others ways to create the rings with scrapbook paper scraps, but I just wasn’t happy with it. 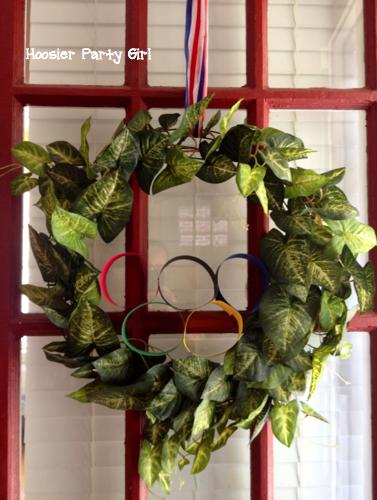 Eventually, I just put the last concoction in the middle of the wreath to make it look more Olympic. I really wanted the colors to show more, so I’m not really happy with this. 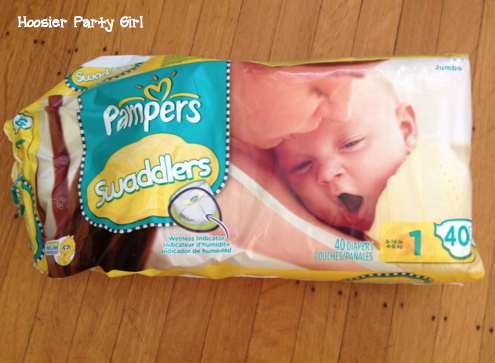 I have a few days before our closing ceremonies party – who has ideas for me? Since the Winter Olympic Games and Summer Olympic Games alternate every two years, I’m not going to give up on this one. This is actually a project that I threw together last minute. I’d had it in mind, but didn’t find the right bows until the very last minute. I got four packages of primary color bows (one each of red, blue, yellow, and green) from Hobby Lobby (I’m starting to think they should sponsor me). 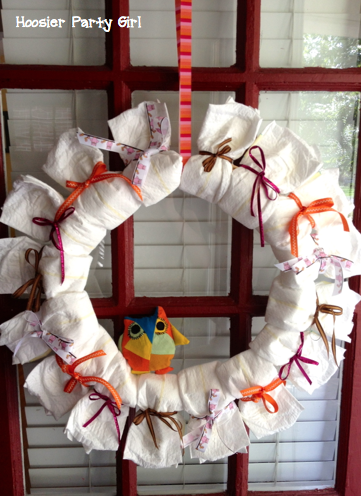 Rather than buying a wreath form, I used a diaper box and an old hat box as a template. It took a few attempts to find the right adhesive for the bows to really stick, but I think I ended up with craft glue. 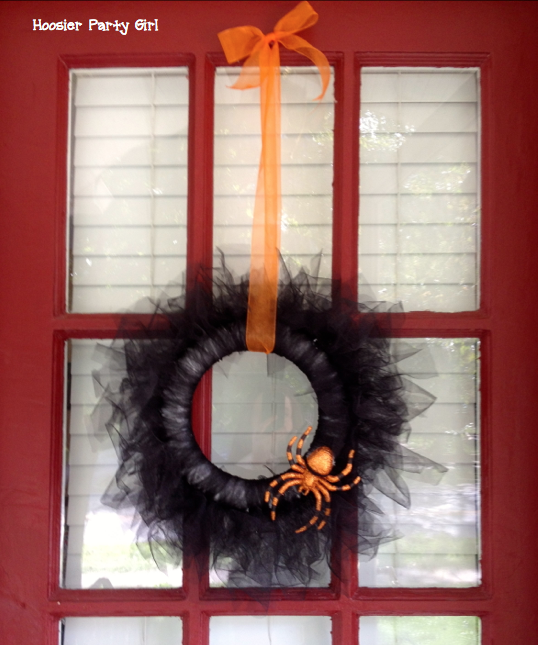 Once I got the bows all the way around the wreath “form”, I tied a “celebrate!” ribbon that I had picked up at Dollar Tree (who should also sponsor me). 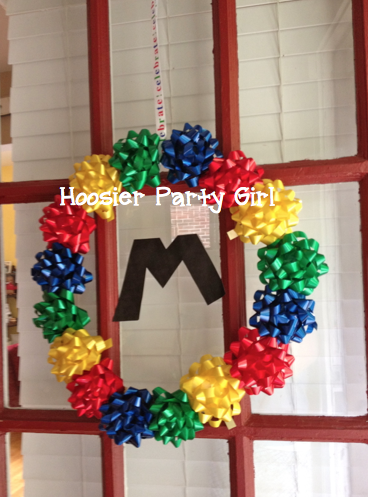 For the Mario Brothers party, I grabbed a free Mario font, printed an M which just happens to be the birthday boy’s initial also, and just used scotch tape to attach it to the door. The hardest part of the entire project was finding the best way to adhere the bows to the cardboard! 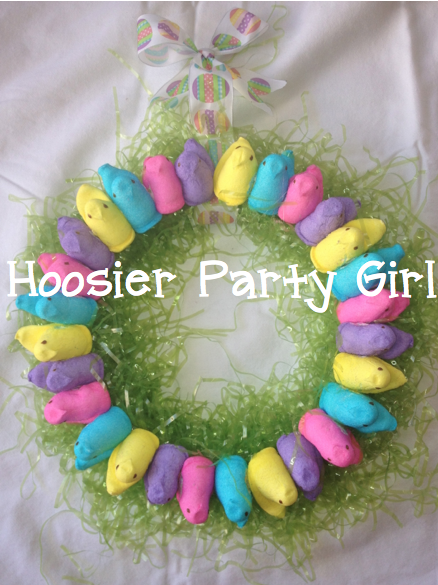 Last year right after Easter (before the advent of Pinterest) I saw a photo of a wreath that was made of Peeps. My mother loves peeps, so I wanted to make her one, but neither Google nor Pinterest could help me find the exact wreath again. I read through all the different versions I saw, and this is what I came up with for my mom. I’m pretty sure she loved it since she emailed me a photo of it hanging in her kitchen the very same night. Yea! I liked it too, so I made another one for my house. 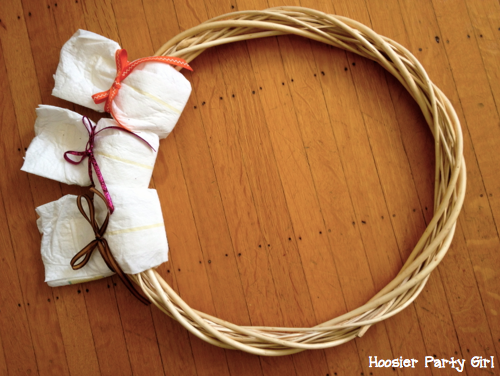 First tie the ribbon around your wreath form. 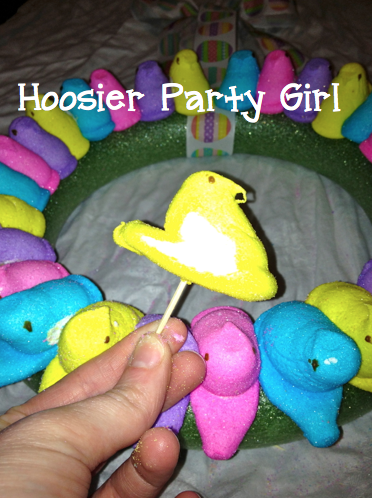 Using toothpicks, secure the Peeps on your wreath form. I found it was easier to put the toothpick into the wreath form first. 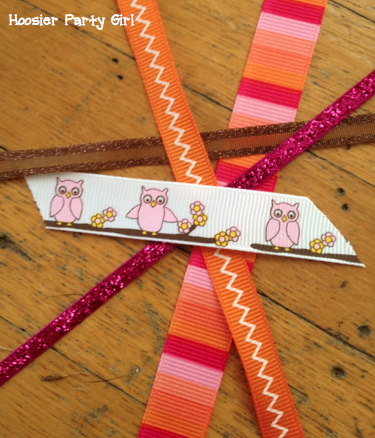 I started from either side of the ribbon and worked my way down and around. Both times I found that I needed to readjust my Peeps to squeeze them in a bit tighter so I could have an even number and pattern all the way around. Feel free to be more free form if you like. 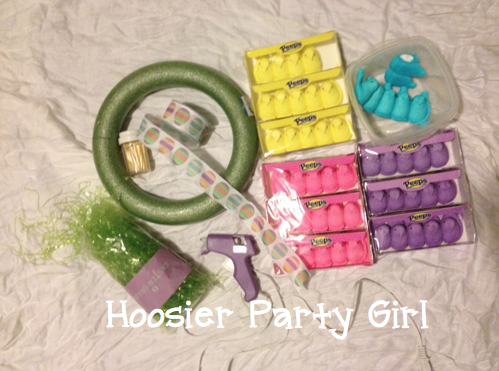 Once they are arranged, you’ll want to spray a sealant on the Peeps. Although Peeps get stale fairly quickly, you want to discourage ants and other bugs from being too interested in your sugary decoration. This is the spray that I found, but if you know of something more industrial, let me know. 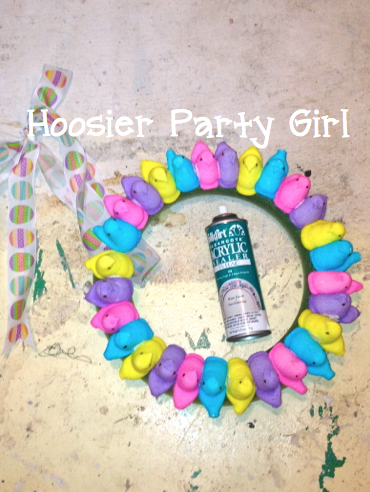 Use your glue gun to slowly add a handful of Easter grass at a time to the wreath form, wrapping it around and gluing it on both sides, so it looks like the Peeps are sitting on the grass. The green form is essential here because it will show through, but it will be unnoticeable as long as it is green. 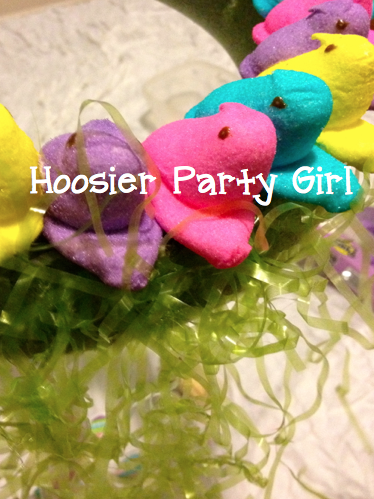 Once you have the grass secured around, you can trim up any stragglers or just let the Peeps party in their wild grass. All that is left is to hang it on the door. If you make one too I’d love for you to comment and link up, so I can see your handiwork. 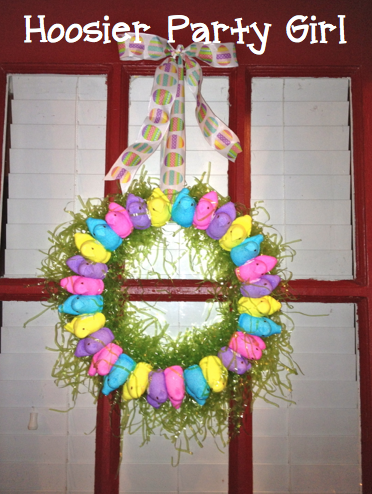 This is the Easter Peep wreath I made for my mother (who LOVES peeps). 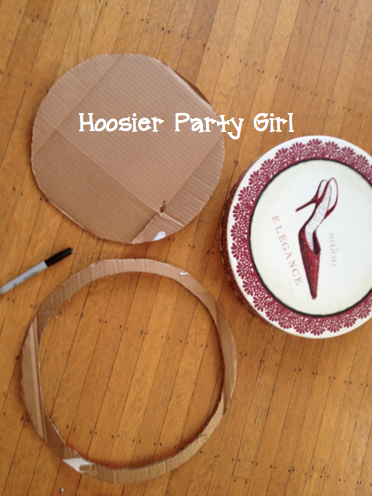 If you want to make your own, here is my step by step tutorial.